NIA promotes, develops and nurtures research and consultancy activities on institutional and individual basis. Areas of study include accounting, life insurance, general insurance, healthcare management, reinsurance, business economics, banking, investment, turnaround management, financial controls, risk management, regulatory provisions, human resource and organisational behavior, information system, marketing, operation and technology management, strategy and organisation. NIA follows an interventionist approach to help influence practice through its consulting and research. The workshops, seminars and training programmes provide NIA opportunity to update the concepts. This helps NIA to offer the latest solution package to organizations. 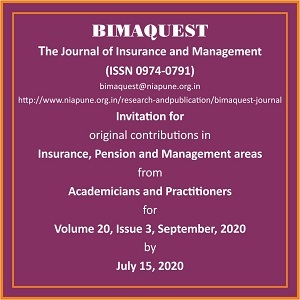 BimaquestPravartak Apart from NIA's own in-house publications like Bimaquest, Dnyanajyoti Research Series (DJRS), Pravartak, research monograms and working papers, NIA encourages our faculty and research associates to undertake commercially viable stand alone or institutional action research projects, publish them in referred journals and present the concepts at national and international seminars. All research projects are referred to at least six subject matter specialists or industry leaders before publication. NIA has a cadre of research associates drawn two thirds from the insurance industry and one-third from our own core professionals. Research and consultancy are components of faculty performance benchmark. Elsewhere, NIA provides a glimpse of some of our completed research and consultancy projects. With opening of the insurance sector and likely prospects of growth, NIA has set up resources to undertake consultancy and sponsored research services across the globe relating to strategy, systems, structure, pricing, product development, data mining, software development and market research. NIA works in close collaboration its our patronising organisations as an integrated constituent for execution of our suggestions. NIA internalises individual learnings into organisational learning. With the insurance archives at NIA premises, it has a strong organisational memory to bank with. NIA always keeps its schedule and steps out of the commercial considerations to provide value-added services and information to the patronising organisations or industries. There is a wealth of talent and experience in insurance industry today. And today, more than ever before, whether it is in life insurance, general insurance and reinsurance, in the investment management or human resource management, talent and experience without the disciplined framework of formal training is rarely enough. Currently, formal training through the MBA curriculum continues to be, the qualification for management career development. For select few, who have the endeavour to sit at the vertex of management academics while remaining practising managers, Ph.D. equivalent fellowship is the desired destination, the Ph.D., which gives equal stress on congenitalisation and well defended dissertation. These are top of the bracket academic requirements. Now is the time for insurance industry to self-propel this top league insurance academics for its future excellence. Keeping this in mind, NIA is launching C. D. Deshmukh Fellowship Programme, which will be of the standard of aforesaid Ph.D. Programme in Insurance. NIA is also launching a value added Masters degree from this academic year after completing all statutory requirements. To upgrade and further globalise our learning softwares, we are negotiating for collaborations with a host of institutions both domestic and foreign. To end with continuity we have many path-breaking ideas at various stages of implementation. Our present is always under challenge from our originality and innovations. If you've ever met a spirited risk manager leaving out of Pune or India, he should also be carrying the aroma of a best-nurtured academic campus of the world and you may find him as an alumnus of NIA. Without doubt our best spokespersons are our alumni. They know how exceptional the NIA experience is, and they're excited to tell the world about it.